This 1986 USA-made Gibson Explorer 4-string bass was converted to an 8-string bass in 1989. A further conversion into a 12-string bass was done the following year. It was "retired" in 1991, leaving the impression that perhaps the owner should have stopped at 8 strings. 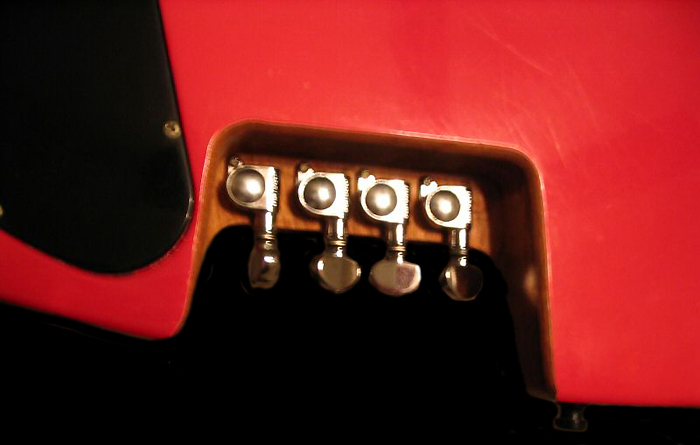 Four octave-string tuners are positioned on the headstock although they are positioned incorrectly, as a result the octave tuners interfere with some strings. A bone nut has been cut for 12 strings but the octave pairs are so close that the strings vibrate against each other. The ferrules for the remaining four octave strings are oddly positioned, requiring the truss rod cover to be permanently removed. 1990 Gibson Explorer 4-string to 12-string bass conversion. Four tuners are positioned on the body. At one time a seat belt was used as a guitar strap and was attached with three wood screws at each end.